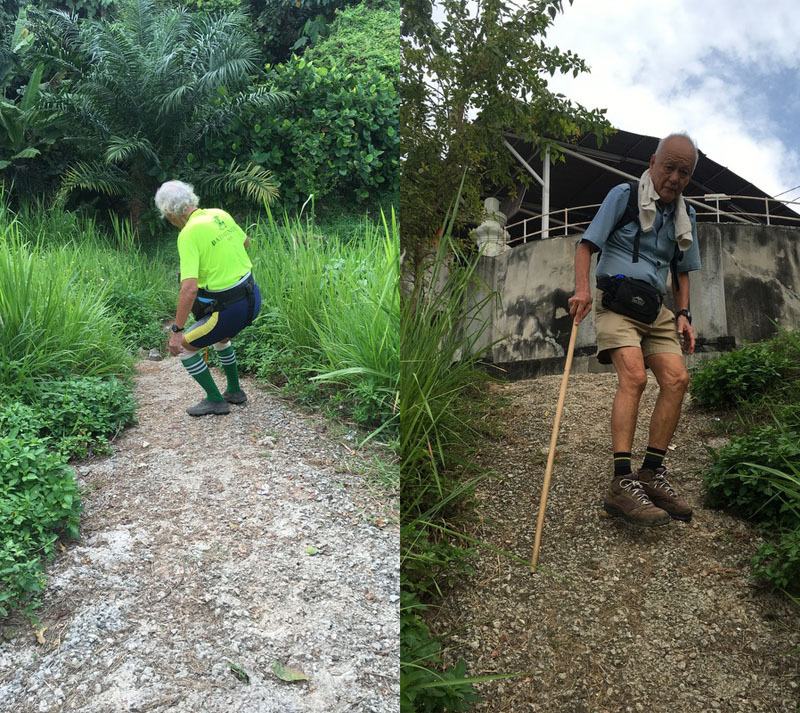 Bukit Kiara is my playground, but there are a few more hills in and around KL where you can hike and enjoy nature. 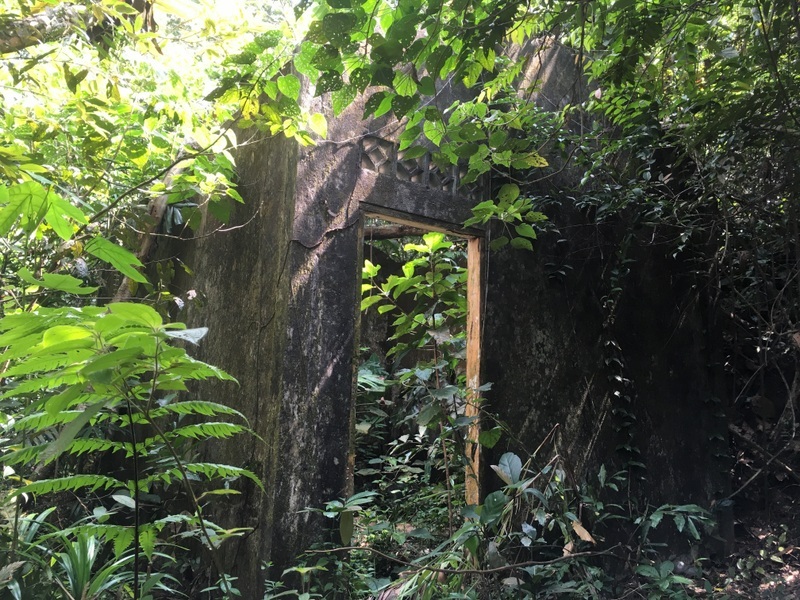 The most popular of them is Bukit Gasing, during weekends it can be a problem to find a parking for your car. 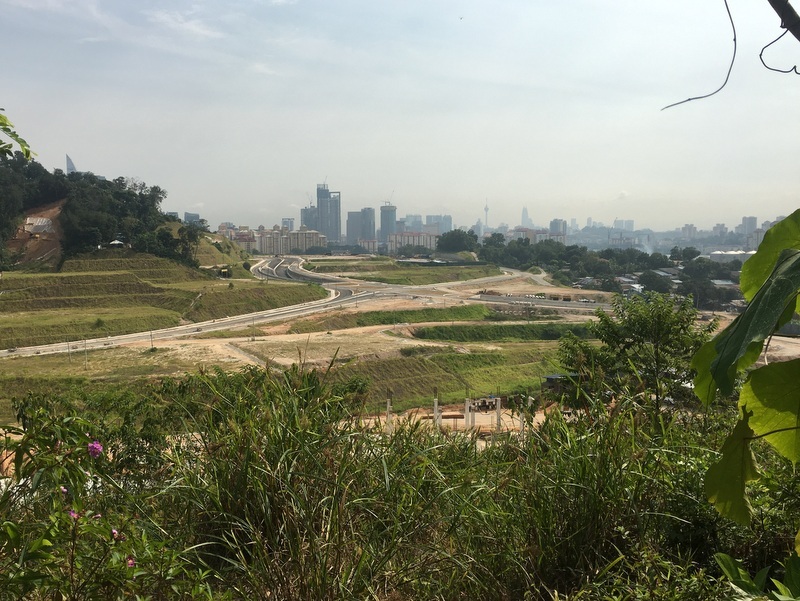 The hill divides Petaling Jaya and Kuala Lumpur, the trails start from the PJ side. Recently I have come in contact with several groups of active hikers. I have joined a few “hashwalks” and made new friends. One of them is Master Ho, he took me and others a few months ago to Air Hitam, see my blog Air Hitam, finally! 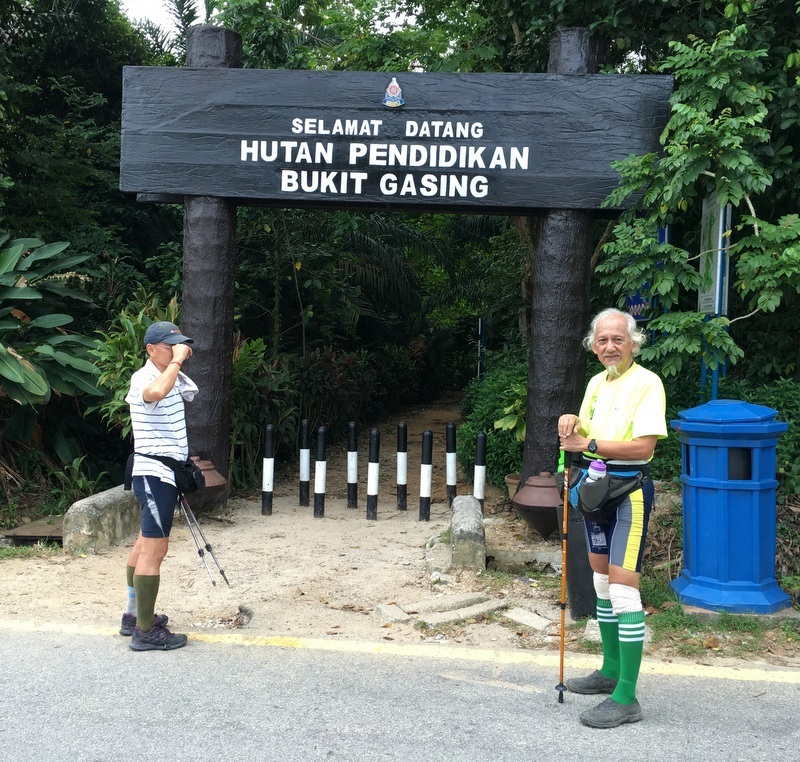 He is a regular walker in Bukit Gasing and was willing to guide me. My friend Hin was interested too. 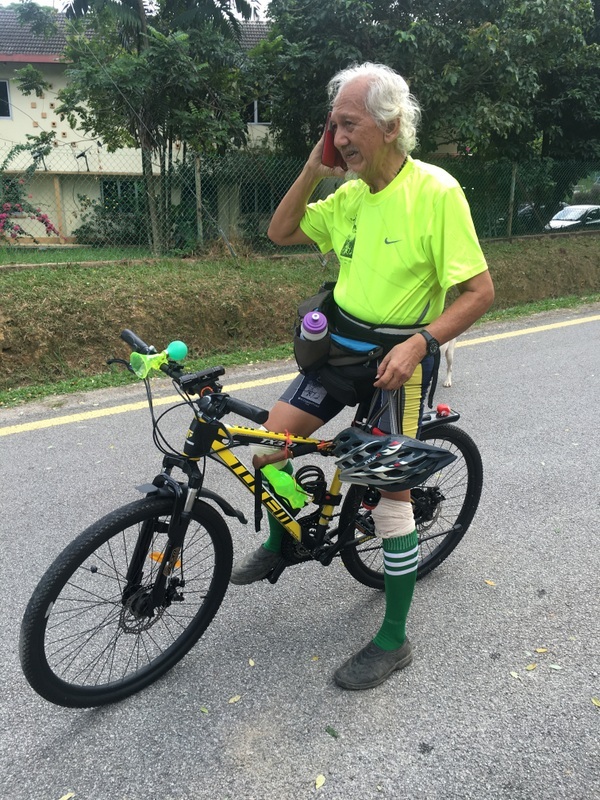 We met at the “Arch”, Master Ho came on his bike and had cycled already 31 km! In the picture he is receiving a call from the “General”, who also was joining the hike. Our first destination was the Indian Temple from where we had a nice (although a bit hazy) view of the Bukit Gasing jungle and the PJ skyline. The Hindu temple dedicated to Shiva is located next to the Telcom tower on the hilltop and was built by Indian workers who put up the first telecom tower, more than 50 years ago. Several landslides have occurred in recent years, after a major one in 2011 it was decided to demolish the temple. But it is still a place of worship and there are plans to rebuild it. Because of the landslides some of the trails have been destroyed. We had to be careful going down from the temple, entering the KL part of Bukit Gasing. Shocking! 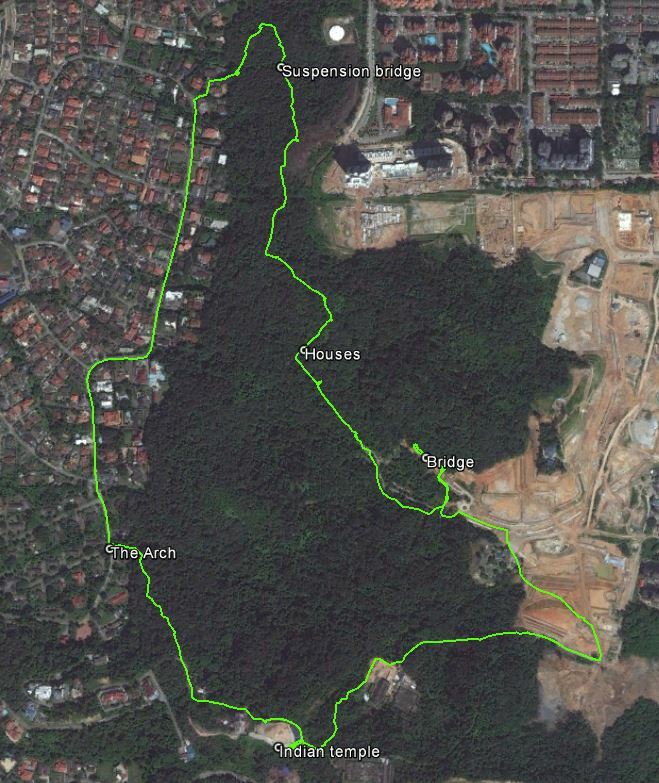 I had read about the difference between the PJ part of Bukit Gasing (protected) and the KL part, (open to development). And sure, it was…:-( Apparently in the right picture there was still jungle a couple of years ago where now everything has been cleared. A few more pictures of this KL side. GE screenshots in 2010 and now. A huge suspension bridge has been built, leading from nowhere to nowhere. There is a campsite, also unused. Spending crony money? It was a relief to hike back to the PJ side. 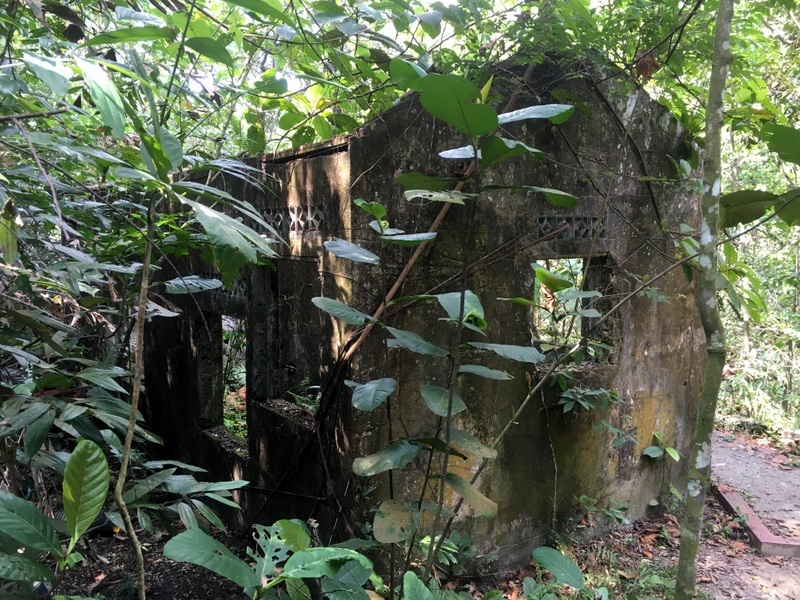 On our way we passed the ruins of two houses, destroyed during the tragic events happening 13 May 1969. Our hike was a relaxed one, spending time to take pictures and, being senior citizens, taking a rest every now and then. Some parts of the trail were quite steep, and there was a very scenic suspension bridge. Note the difference between this bridge and the huge unused one! Altogether we walked for more than three hours. 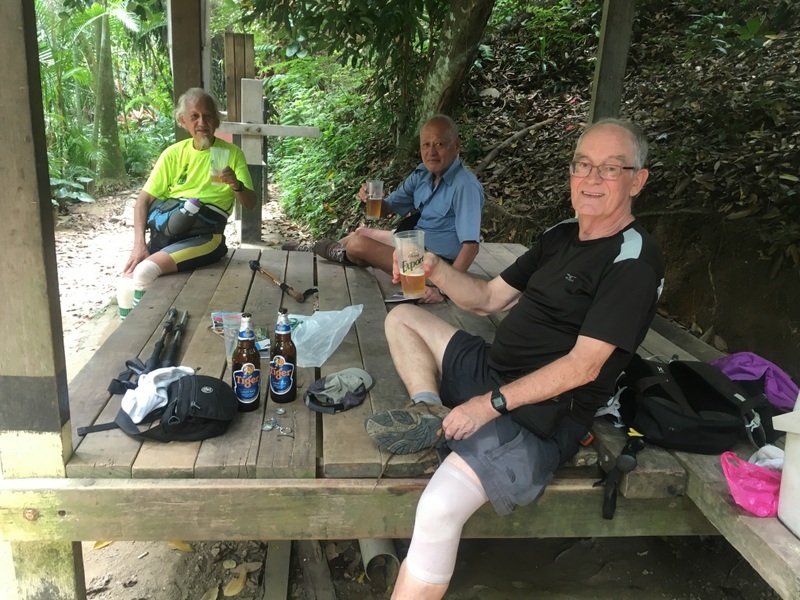 When we finished our hike at the hut near the Arch, the General came with a nice surprise: a coolbox with ice-cold Tiger beer. Delicious. 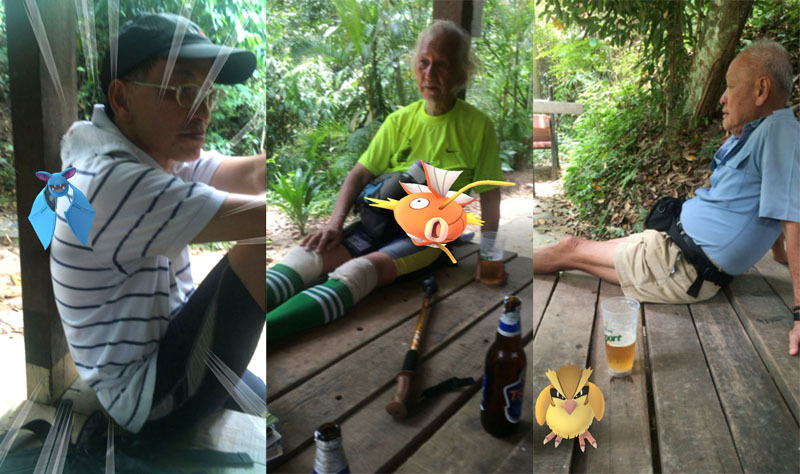 We had a nice conversation and I also managed to catch a few Pokemons…. :-) Very appropriate in the Chinese 7th lunar month, when the ghosts can roam freely on earth. Here is a GE map of our hike. It was a nice hike, buth I think I still prefer Bukit Kiara.